Runners, listen up: If your body is telling you that your pace feels a little too fast or a little too slow, it may be right. A new study, published online March 18 in the Journal of Human Evolution, shows that the efficiency of human running varies with speed and that each individual has an optimal pace at which he or she can cover the greatest distance with the least effort. The result debunks the long-standing view that running has the same metabolic cost per unit of time no matter the speed — in other words, that the energy needed to run a given distance is the same whether sprinting or jogging. Though sprinting feels more demanding in the short term, the longer time and continued exertion required to cover a set distance at a slower pace were thought to balance out the difference in metabolic cost, says Karen Steudel, a zoology professor at the University of Wisconsin–Madison. However, Steudel and Cara Wall-Scheffler of Seattle Pacific University have now shown that the energetic demands of running change at different speeds. “What that means is that there is an optimal speed that will get you there the cheapest,” metabolically speaking, Steudel says. Peak efficiency was determined by measuring runners’ metabolic rates at a range of speeds enforced by a motorized treadmill. Metabolic energy costs increased at both fast and slow speeds and revealed an intermediate pace of maximal efficiency. Interestingly, the slowest speeds — around 4.5 miles per hour, or about a 13-minute mile — were the least metabolically efficient, which Steudel attributes to the gait transition between walking and running. 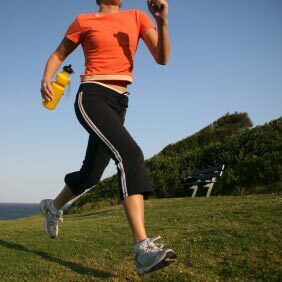 For example, she points out, both a very fast walk and a very slow run can feel physically awkward. “They wouldn’t have had noticeable waists — their torso looked more like the torso of an ape, except they were walking on two legs,” Steudel says. “With the genus Homo, you start getting taller individuals, larger individuals, and they started developing a more linear body form” with distinct waists that pivot easily, allowing longer and more efficient strides.